The perfect Goan vacation has some irreducible elements. You have to experience peace and quiet amid natural beauty and compelling architecture. There must be great food at each meal, focused on the state’s fantastic fresh ingredients. Perhaps the best of all is Aashyana Lakhanpal, the holiday home of the art-collecting industrialist Ajay Lakhanpal. This stunning modernist villa is filled with spectacular contemporary Indian art. Best of all is the location on a huge plot of land full of coconut trees, with one of the best swimming pools in Goa, right on the best part of Candolim beach. Nearby is another distinctive villa. Rockheart is the second home of the late Frank Simoes and his wife Gita, whose expert touch has filled the property with exquisite details. Also, with a private entrance to the beach, this villa and many other great villas are available through Lazy Days, a British-run rental agency that manages many of Goa’s best properties for their owners. More in a conventional hotel mode is Siolim House, an intelligently adapted Indo-Portuguese mansion built around a pretty courtyard. Calm also pervades Panchavatti, the hacienda on Corjuem island created by Loulou Van Damme, a yoga-loving Belgian who has lived in India for many years. 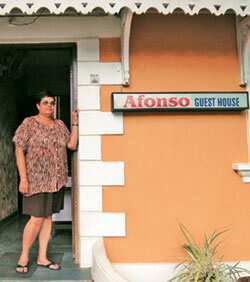 At another end of the price spectrum is the Afonso Guest House, a budget, family-run inn on the prettiest side-street in Fontainhas, the dense neighbourhood of colonial-era houses in Panjim. No high-falutin spa cuisine here but there’s oodles of atmosphere and heritage, and a warm, generous family-type environment. That’s what a Goa vacation is supposed to be all about. Candolim (0832-2489225, ‘www.aashyanalakhanpal.com’). Casinhas from Rs45,000 to Rs1.45 lakh per week, depending on season, villa from Rs2-5.6 lakh, depending on season. San Sebastian Chapel Square, Fontainhas, Panjim (0832-2222359). Doubles, Rs800. Check website for availability and prices for Rockheart, Kiranpani and other exclusive villas. Lazydays.co.uk. Doubles from Rs8,000, includes all meals (9822580632, Islaingoa.com). Doubles from Rs6,000-9,000. Siolim (0832-2272138, ‘www.siolimhouse.com’).